There are a few different classifications of motor yachts that you here about. Depending on what you are looking for, it’s going to show you what kind of yacht you need to go buy. 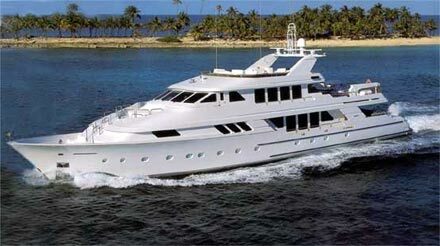 Motor yachts are different from normal yachts, but they are just as much fun. In fact, having a motor yacht is a sure fire way to never get stuck out at sea, and that is why a lot of people use them. Choosing the right motor yacht for you is not hard, you just have to know how much you are willing to spend. After all, yachts can jump up in price pretty fast, and you do not want to spend too much. Choosing the best motor yacht for you is determined by many different things. First of all, are you going to want to say out on the yacht for a day or for a weekend? If you are looking to just stay out for a day, then you may want to get a Day Cruiser Yacht. These are yachts that do not have cabins, and they usually do not have amenities, like a refrigerator or plumbing. However, if you are looking to stay out on your boat for a while, you are going to need a Weekender yacht. These are yachts that can have one to two different cabins and have a lot of things you need in order to live on the boat. People can live on their boats for years without ever coming off. If you are into sport fishing you could even get a sport fish yacht. As you may guess, this type of yacht is full of equipment that you may need to go fishing. Last but not least would be the Luxury yachts that can have more luxurious amenities than even most houses do. 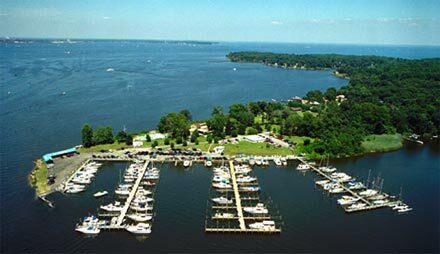 Yacht clubs play a significant role in popularizing the sport among the people. The clubs function as a forum that unites the yacht owners, racers, sailing crew, etc. 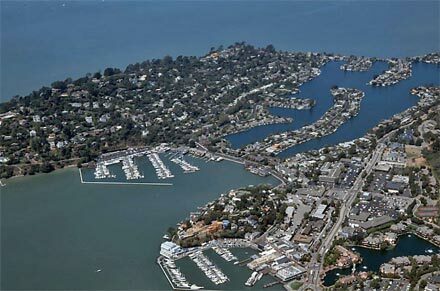 Yacht clubs unite the like minded individuals, who aspire to make the sport popular and who enjoy the sport. The clubs contain an administrative body that is the deciding authority and have paid staff, which enhances the functioning of the club. The clubs also organize educational programs about the event, yacht races and promotional events. They organize ‘sailing programs’ for children and interested people. The clubs bring the talented people to the limelight. The vision of a yacht that flows through the water surface with its silken sails unfurled is a sight to cherish forever. The excitement is manifold, when we sail in a yacht to explore the hitherto unexplored waters. Yacht clubs are popular among youngsters and it is considered to be a sport that tests the endurance skills of a person in the water surface. Yacht clubs are the sporting clubs that encourage and even endorse the sport among the sporting community. The clubs also launch promotional and educational programs. Yacht clubs are places, where people, who are like-minded, meet to exchange views on the sports and initiate programs to increase the popularity of yacht racing or sailing, in general. The club focuses on the membership of people who are interested in the sport and the owners of the Yacht. 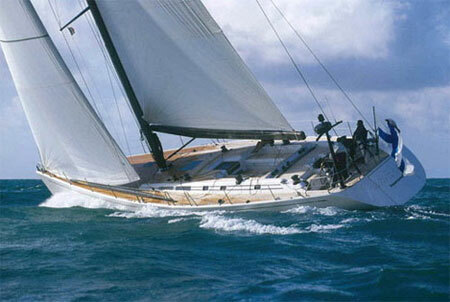 The clubs also organize yacht racing and sailing events to increase their popularity. There are a lot of different types of boats out there that are just waiting for you to come out and buy them. However, if you are one of those people that is looking for something that no one else has, then you may not be happy with any of the boats you see. This is why there are boat builders out there. These are people that will build a boat for you, at a price. If you have enough money to be able to go out and build your own boat, then you are going to be able to make your dream boat. Sometimes it’s hard to find everything that you want in a boat. That is why you need to build you own. We all know things tend to be better when they are customized. This holds true for boats as well. Now, most people only think about customizing cars, houses, and things like that. However, customizing your boat could be one of your favorite things to do. Being able to customize your own boat can cost a lot of money, but you are going to end up with something that you truly love. Of course, some people are not happy with just customizing their boat. Some people want to have someone build them a custom boat. To have your own boat built from the ground up is something that a lot of people cannot afford to do. If you have the money to do something like that and you want to build yourself a dream boat, this is the best way to go about it. If you are looking to pick up a hobby, you could aways do it yourself. Cats have been noticed because of their many benefits over monohulls. First and foremost is their greater stability in rough waters. When it comes to sailing this advantage is definitely noticed. Monohulls tilt to one side while sailing due to their v-shaped hull. Passengers have to deal with the fact that while the boat is sailing they have to tilt to one side the entire time. This creates discomfort when trying to move around the vessel. Catamarans stay consistently level while sailing, allowing for passengers to get around without having to bend and contort to maintain balance. The extra stability makes it safer for children to run around and play on deck. The elderly can have more of an enjoyable time, because of the lack of physical strain involved in getting around the boat. Catamarans make it easier for novice sailors to get a handle on maneuvering and sailing the vessel. Cats have excellent load-carrying abilities. This is why they are often used as ferries; they provide a safe and stable platform. When there is added stability and a lack of heeling the chances of someone becoming sea sick is reduced. Passengers will be more inclined to stay off land for greater lengths of time when their comfort levels are high. Catamarans have the ability of smothering rough water. The environment that is created by having two parallel floats(hulls) causes for air to be trapped between these two apparatuses providing additional lift. This provides an invisible cushion as the vessel passes over wakes and waves. Multihull Advantages – Catamarans have been popular for many years in parts of the world such as Australia, France, and South Africa but have not caught attention in North America until recently. Catamaran sales have grown significantly in the past ten years in North America, and the subject of comparing cats and monohulls has become commonplace. Catamarans have been the fastest growing segment of the sailboat market. In the past couple of years the growth of this market has been over 20% per year. Due to this rising market’s popularity the demand is greater than the supply at this moment. Taking this into consideration, catamarans have higher resale values over monohulls. Cats have been selling at prices close to or greater than what the owner originally paid for the vessel. This advent is firing the growth of this industry. Speed – Catamarans will take you faster to where you want to go over monohulls. It’s not a question about whether you’re sailing or under power, catamaran designs are faster overall. The overall speed of a cat compared to a monohull of the same size is about 20% faster. Cats are being designed with smaller keels this indeed improves closed-hull performance. Monohulls are limited by a maximum hull speed; this is not the case for multihulls. The elongated thin hulls of a cat limit a bow wave. The amount of wind at a certain point in time is what will limit your maximum speed while sailing. Monohulls can only travel as fast as their bow wave to stern speed. Catamarans are lighter for their length compared to monohulls. Cats usually have taller masts with bigger sails. Pontoon is one of a number of floats used chiefly to support a bridge, to raise a sunken ship, or to float a hydroplane or a floating dock. 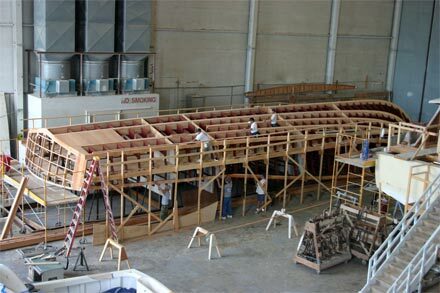 Pontoons have been built of wood, of hides stretched over wicker frames, of copper or tin sheet metal sheathed over wooden frames, of aluminum, and of steel. The original and widespread use was to support temporary military bridges. Cyrus the Great built (536) the earliest pontoon bridge in history, using skin-covered pontoons. However, pontoons are usually flat-bottomed boats. And these specialized pontoon boats require a different kind of boatlift to support it and give the ultimate and best results. 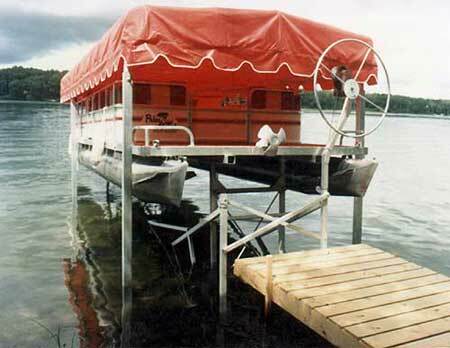 Offers a complete line of maintenance free aluminum pontoon lifts. Our lifts are designed and engineered with features that make each lift work with your particular boat or pontoon. Adjustable leveling legs make it easy to set the right depth and our self-braking winch system allows for safe and easy operation. Most of the pontoon boatlifts are constructed of high quality marine alloy aluminum for maximum strength and durability. Aluminum is completely rust proof and corrosion resistant. Weather or ultraviolet rays do not affect it. Bunk assemblies adjust both vertically and horizontally for maximum pontoon boat support. With an ageing population, more pontoon boaters are turning to motorized systems and manual operating system is fast becoming a thing of yester years. Therefore, with the advancement of technologies, pontoon boatlifts are available with the best of facilities like remote controls, AC charges and solar power which adds to the comfort to meet the everyday need in a less time consuming fashion. Initially, we would think that the boat accessories industry does not carve a significant niche in the consumer market. How many people would actually own boats? Or how many of these people would spend good money dressing up their boats, for that matter? In reality, however, boat accessories are as fashionable as bags or apparel. There are boat accessories for different types of boats, and at reasonable prices, too. There are a variety of boat accessories ranging from technical products such as tie downs, navigation lights, and pumps to electronic ones such as radar systems, radios, and lights. You will also find functional items such as seats, covers, and ladders. Not to be missed are the motor parts with the corresponding lubes. 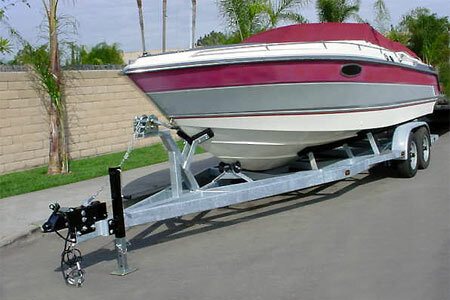 Another category in the boat accessories market would include pedestals, fasteners, winches and jacks, spark plugs and starters, flooring and other internal setting items, tires and couplers, gauges, flotation aids and devices, anchors and rod holders, till and trim auxiliary materials, and fenders and dock lines. Jackets, mooring equipment, heaters and lights, buoys, paddles, lifts, and hoists make up the precautionary products of boat accessories. Boat accessories that cater to the “lighter side” of boating life consist of barbecues, grills, and swim decks with showers. One of the best ways to enjoy your vacation is to spend it on a house boat. 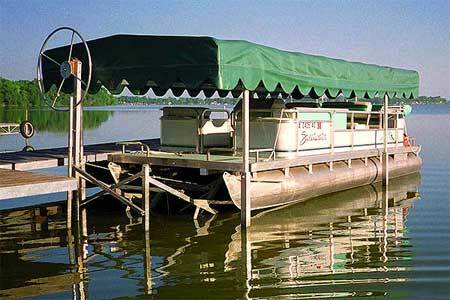 Houseboats on the Mississippi river are well known for their tradition and as the best way to explore this vast river. But the small inlet rivers and the many lakes in the US are great for exploring on a house boat. Your boat rental is really a luxury condo on the water. You can have every available facility from a microwave for cooking your freshly caught fish to a washing machine and the latest sound systems. These craft can feature virtually anything in the way of convenience that you are accustomed to at home. Imagine waking to a brilliant orange sunrise on the lake and going for a swim before breakfast. …or going to bed with the soothing sound of gentle waves caressing against your house boat. It really doesn’t get much better when the boat rental is a house boat. From their humble origin in the past the sail boats of old have slowly evolved into the luxury boats of the wealthy. As late as the nineteen eighties electric lights in a yacht was not common. Now most yachts will have refrigerators, air-conditioning, and state-of-the-art cooking appliances. Yachts today use a combination of sails and motor for propulsion. A yacht boat rental is not cheap, but it would be one of the most memorable vacations you’ll ever experience. It is a challenging set of issues the finance and expenditure select committee’s members have set themselves as they embark on their inquiry into monetary policy. Whether they have bitten off more than they can chew remains to be seen. Has something gone fundamentally wrong with the monetary policy framework since the late 1980s? Were the “give growth a go” changes to the policy targets agreement five years ago a mistake? Monetary policy needs mates, as the saying goes, but have they been letting it down? Or is it just a case of a poor workman blaming his tools? Are we confronting the downside of globalisation or are the problems closer to home? One person who suspects something has gone fundamentally awry, evidently, is Michael Cullen. In a speech this month, the Finance Minister said the consensus had been that the monetary policy framework did not have an impact on long-run growth. Even with its recent falls, from a stratospheric US81c, the dollar remains significantly over-valued and has been for much longer than in previous cycles. The kiwi has been above US70c for less than 7 per cent of the time since it floated in 1985 but it has been above US70c for most of the past three years. Tartan was one of 72 yachts which left Sydney Harbour last Saturday afternoon following the start of the Audi Sydney Mackay and Audi Sydney Gold Coast yacht races. The Audi Sydney Gold Coast fleet pulled in to port at Southport while four yachts passed through the finish line and continued on to Mackay. Tartan was the last to finish, at 6.50am this morning, marking the end of the longest ocean race in Australia. Skipper Ian Sanford was delighted with the outcome of his first ocean race, ‘no breakages, no seasickness and the crew of long term friends are still long term friends’ but wasn’t as thrilled with being becalmed off Fraser Island for a day and a half. Frontrunners Limit and Sailors with disabilities had sufficient wind and therefore boat speed to take on the 1.5 knot opposing current with little resistance but by the time Amante and Tartan reached Fraser Island there was barely a breeze blowing. A ground-breaking ceremony was held July 9 at Altamer Resort, one of the world’s most luxurious villa resorts, to launch a joint venture partnership with Island Global Yachting (IGY). The five star mega-yacht marina and real estate development will comprise a luxury resort hotel along with retail and residential components, and will be the first marina facility on the island. It is scheduled to open during the fourth quarter of 2009. The Altamer Resort & Marina project expands on the vision of owners Rebecca and Michael Eggleton to develop a product that would appeal to the upper end of the tourism market. Architect and Interiors: Designed by internationally-renowned architect Myron Goldfinger with interiors by June Goldfinger. Remarkable Features: Altamer is fully equipped with every amenity and luxury including for each villa a staff of ten, butler and concierge service, two housekeepers and staff, grounds person and the option of a private professional chef.